Sticky buns are really G-d's gift to man. Warm, cinnamon-y, caramel-y, pecan-y... I could go on and on with the made-up adjectives. But making them requires using yeast and waiting for the dough to rise, and ain't nobody got time for that in kollege. Hence the genius of this twist on a classic - using store brought bread! To start, mix the cream cheese, powdered sugar, milk, and vanilla in large bowl. This will take some elbow grease! Next, cut the crusts off of 35 pieces of store-bought bread. I used raisin bread, though plain old wonderbread is definitely better as its the spongiest out there. Lay the slices overlapping one on the other, in 7 strips of 5 pieces each. In a small bowl, melt some butter in the microwave. Stir in cinnamon and sugar. Brush this thoroughly over the strips of bread. Then, spread the cream cheese mixture overtop. Roll one of the strips of bread over on itself. Roll another strip of bread over this rolled strip, and so on, until all of the strips of bread have been rolled into a wide cylinder. Do this carefully! This may not look like it's working, but trust me, it does, and the visual effect is mezmerizing. To make the caramel sauce, mix butter, brown sugar, salt, vanilla, and honey in a saucepan over medium heat until combined and bubbly. Make sure to mix constantly! Next, assemble the cake in the baking tin. Pour 2/3 of the caramel mixture into the bottom of a round cake pan, and sprinkle pecans over top. 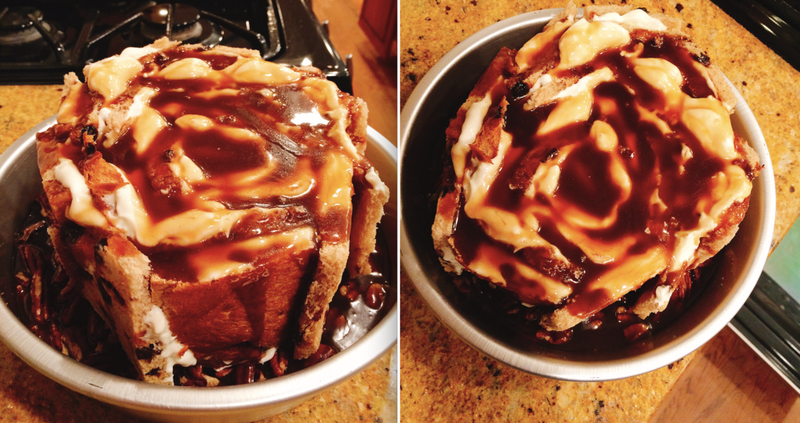 Place the cake on top, and finish with a drizzle of the remaining caramel sauce. Bake for 40 minutes, until the top is crisp. Then, flip the cake. Place a large plate on top of the baking dish and invert it carefully, while wearing oven mitts. Ta-da! And there you have it - All the decadence and nostalgia of sticky buns, but with fun and crafty rolling instead of boring standing around. Even better, this recipe can be tweaked a bit for a totally different flavor profile! Next time I would make it with a pumpkin filling for some autumnal savoriness instead of summery sweetness. But don't mess with those candied pecans - they deserve a recipe all their own, they were that good. In a large bowl, mix the cream cheese, powdered sugar, milk, and 1 teaspoon of the vanilla until uniform. Cut the crusts off of the white bread. Lay out 7 lines of 5 slightly overlapping slices. In a small bowl, melt 3/4 cups of the butter. Mix in the sugar and cinnamon. Brush this mixture on each line of bread. Spread the cream cheese mixture on each line of bread. Roll up one of these lines of bread. Roll another line around that roll. Repeat until each line has been rolled, creating a wide cylinder. To a saucepan over medium heat, add the remaining 3/4 cup butter, brown sugar, honey, remaining teaspoon of vanilla, and salt. Mix constantly until everything has melted into a caramel. Pour 2/3 of this caramel into the bottom of an 8-inch cake pan. Sprinkle the pecans overtop. Place the bread roll in the pan, and top with the remaining caramel. Bake at 325F for about 40 minutes, until the top of crisp and bubbly. Invert the cake to serve.